Type A: Directions Not Included, 8 Days 'Til Christmas!!! Hi everyone! I'm so glad that Tammy asked me to be part of this series. We've been seeing some great stuff making an appearance on this blog this month - such a great turnout! In case you don't remember me, I'm Anna from Directions Not Included. I'm going to show you a super easy holiday craft that can be used to add a little holiday decor to your home or serve as a nice handmade gift. White square tiles are only 16 cents a piece at my local home improvement store. 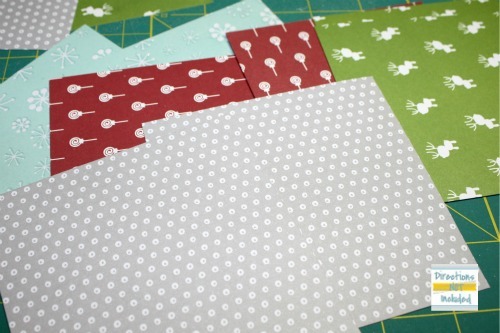 Couple that with some scrapbook paper, felt for the bottoms and Mod Podge and you have an inexpensive craft to try. I cut them down to size using a ruler and a craft knife. I sized the paper so there would be a small edge of white tile exposed. If you want the paper to cover the entire tile, make sure to measure your tiles. They are always slightly different than the advertised size at the store. 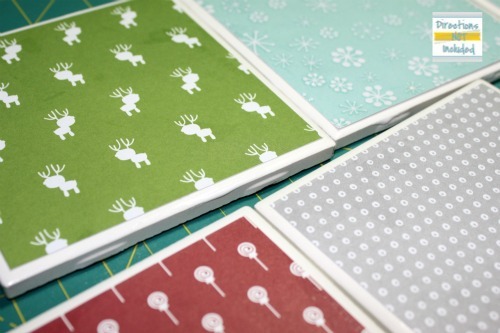 Use a decent layer of Mod Podge to adhere the paper to the tile and let them dry. You want to use the edge of a credit card or your fingers to smooth out any air bubbles you may get. 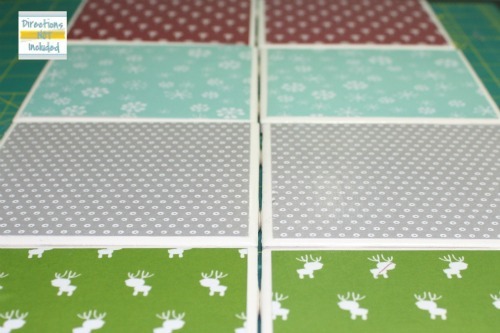 Once the paper is securely adhered to the tile, apply two to four layers of Mod Podge on top of the paper and tile to set the top of the coasters. 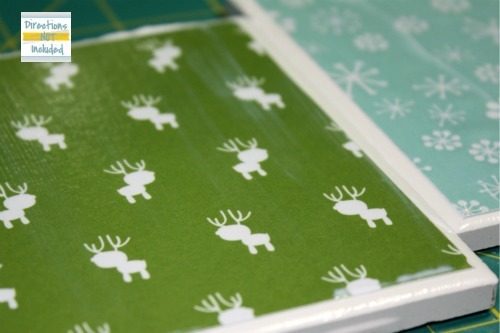 You need to let each layer dry completely between each layer. Be patient and let it fully dry between layers for the best protection and coverage. Use some felt cut down to size for the bottom of the coasters. You can use craft glue or a glue gun to attach it. 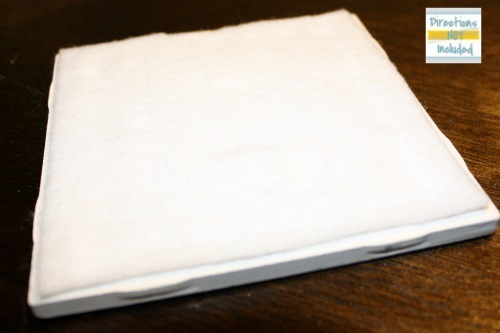 If you don't have felt in sheets you can also use the little felt circles with adhesive they sell in the stores for furniture and accessories. 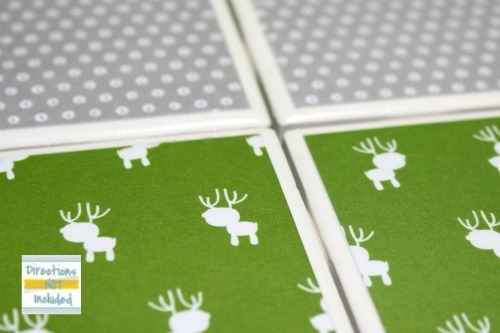 When it is all said and done, you have a cute set of decorated coasters all ready for the holidays! I hope you all have a very happy holiday season! Hope you stop by and visit at Directions Not Included. Anna always has the best projects! Love this idea for a holiday hostess gift! these are so cute! 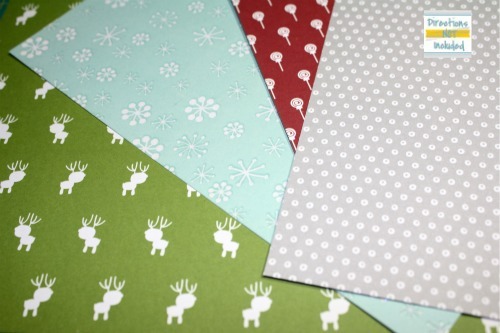 i love that reindeer paper! anna is one of my favorites- so glad you had her here today!